I've always wanted to do a series of articles like this. Mainly because I find so many interesting things in the FTW Blog rolls and I want to share them with everyone. Trouble is, I didn't know how to do it. I think I'm going to try this irregular series as a way of letting you all know of the things I find in the blogrolls that catch my eye and more importantly why they do. I'm hoping this will drum up a bit of educated discussion as opposed to just being eye candy or a simple tutorial to show how something is done. Of course the first example here is not from the blogrolls, but from the GW newsletter we all sign up to get that comes every now and then telling us about new stuff coming down the pipe. As I was looking through it, I came to this picture and the one thing that stood out to me was his face and hair in contrast to his cloak and surrounding shirt area. If you look at his face and hand, they have highlights and shadows, but the range is somewhat limited to the higher end of the spectrum. The real thing is where his hair meets the side of his face. There is no dark shadow like there is at the base of his neck or between his hand and the side of his face. The area is the same, but the treatment of the recessed areas is completely different. The painter took deliberate steps to keep that area (face/hairline) light. By contrast, he deliberately took the time to make the shadows around his neck very dark to the point of being black in appearance. Same goes for the inside of his ear... it's darker than the immediate area as well. It shows me the painter has paid careful attention to the ins and outs of the whole area to be shaded and hasn't just done a wash and then picked out highlights leaving a constant "shaded" portion with only varied highlights. Like I said, varying your shadows. So if you prime something like this a lighter color to make your light colors easier to paint and then basecoat your individual sections their appropriate color... how many of us take the time to set apart our dark areas like this? Knowing that you should not push the shadows along a hairline, but really push them to the extreme only a few centimeters away on the same surface where that same element recesses into a really dark area. I think the attention to this kind of shading really adds depth to the model and can bring it to life in a way most of us don't take the time to do. I know I fail at this more often than not. I'm getting better with it, but I'm still working on the varied highlights... I haven't graduated to varied shadows quite yet. 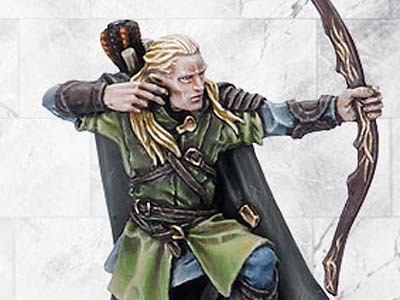 It's all about contrasting, and a great way to emphasize different parts of your minis. You're right. I try to do it when I think of it. I went all out once when I painted a Blood Angel model and tried to vary the shadows over the whole model. I even try to do it a little bit on my tabletop stuff too. I'm learning more about it or maybe it's more in my mind since I started doing a zenithal type highlighting. As I do that, I'm forced to try and consider where the shadows are on the model and not just look at the recessed areas for the shadows. I'm trying to do the same zenithal highlighting on some BA sternguard. I've based where to do dark/light shading on what was hit by spray basecoating; black all over followed by red from above to leave black shading, so I go from orange to black within a shoulder pad. I'm finding it a really interesting way to paint. I'll get some pics up soon!